The Ministry of Defence (MOD) has received the first of 515 new 40mm cannons to be delivered by CTA International (CTAI), a 50/50 joint venture between BAE Systems and France’s Nexter Systems. Known as the Cased Telescoped Cannon System, it is being manufactured at CTAI’s base in Bourges, France. 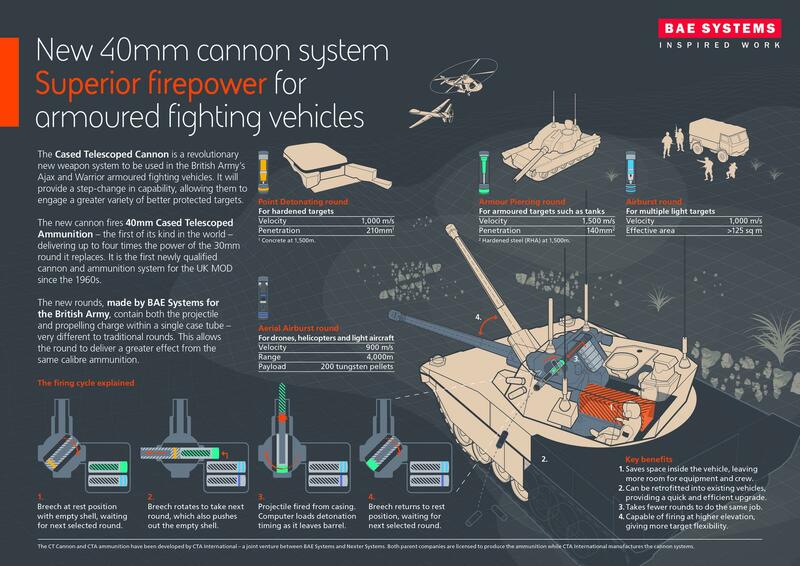 Rather than the traditional bullet shape, the cannon uses ammunition contained in a straight tube, and according to BAE Systems it will deliver an explosive charge up to four times more powerful than the 30mm rounds being replaced. “This is a significant milestone for CTAI and a proud moment to see our cannon being handed over to the British Army,” said Craig Fennell, managing director of CTAI. 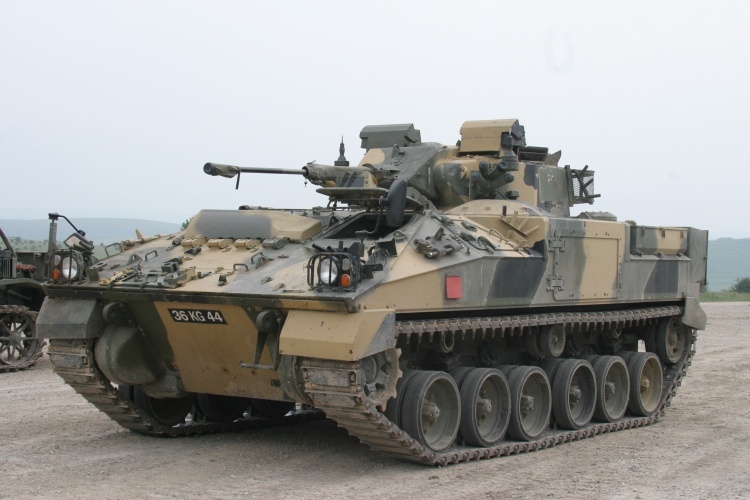 CTAI was set up in 1994 to explore the development of a cased telescoped cannon solution, and later given a contract by the MOD and France’s Direction générale de l’armement (DGA) for the integration of the cannon with the British Army’s Warrior tank. The cannon was mandated by the MOD in 2008 for use in the Warrior and FRES (now Ajax) vehicles, and will also be used on France’s Jaguar armoured vehicle. Ammunition for the system is loaded sideways using a new rotating breech system, before turning 90 degrees and then fired. BAE Systems says this helps save a large amount of space inside the vehicle, allowing for storage of additional ammo and other equipment. Current types of munitions include armour piercing and point detonating rounds, while two separate types of airburst rounds are also in development – one for light ground vehicles and infantry and another to target drones and light aircraft. Both BAE Systems and Nexter Systems are licensed to produce the ammunition for the cannon. BAE Systems will be supplying rounds for the British Army through its munitions factories in Washington, Tyne and Wear and Glascoed in Wales. The contract for the 515 cannon systems with the MOD is worth around £150m, and will see the weapons delivered over the next six years. Delivery for the French Jaguar programme will overlap with this timeframe, and the assembly facility also has the potential to increase capacity and fulfil other orders. “…first new cannon system in 60 years”,the “RARDEN” cannon entered service some 45 or so years ago therefore your headline is not accurate…A small point, but it seems to me that present day writers on defence matters lack even a basic basic knowledge of the subject….. Apologies Tony, headline was supposed to read “since 1960s”. Amended now. They are referring to the cannon and the round, to quote ” the first newly qualified cannon and ammunition system for the UK MOD since the 1960’s”. In other words – sales hype. More hot rocks? We Engineers are giving the military Faster and faster ways of doing things that are surely less and less necessary. So nothing new there. The only element of artillery that I recall from learning its mathematics so long ago was the difference between a howitzer/mortar trajectory and that of a normal aimed shell. They were opposite sides of the 45 degree angle from the horizontal and are simply/in essence the two solutions to the parabolic equation of motion. Try telling that to a squaddie (or a Sandhurst trained officer) and as you do take a look at the face and comprehension of the second? I was a ‘squaddie’ and served in the first gulf war. Since leaving the army I’ve worked as a computer and electronics engineer most recently in R&D. ‘Squaddies’ may not know the concept of the parabolic equation of motion, they just need to know how to use the weapons systems provided for their use. I find your comments patronising, without merit and they betray an underlying ideological bent. Maybe the designers of this system could say something equally patronising that would leave your face with a look of incomprehension. What he might be annoyed to learn is that those ‘well versed in the art’ of NBC protection (including many UK and US researchers from quasi-military establishments/ myself) were well aware, notwithstanding Bush and Blair’s assertions otherwise, dodgy dossiers et al that prior to Gulf War II, Iraq had no WMD whatsoever. [As we said, find protective suits and we might be convinced: until then not!] Several years ago, I had a letter published in the Times: it elicited a response from a general, no less, who obviously spluttered into his corn-flakes reading my comment(s) about the conflict groups. You know who they are, I hope. PS; “betray an underlying ideological bent.” I hope I demonstrate neither betrayal, nor any bending. I do not believe in this era of enlightenment, well educated population(s) the absolute advance of technology, and the gradual unlocking of nature’s secrets (by science) and their implementation (by we Engineers of all levels and disciplines) that it is necessary for our educated leaders (if they are) to wish to encourage the ‘throwing of hot rocks’ at our apparent enemies. There are better -cyber- ways to deal with them. I’m a bit mystified by your last sentence. Are you suggesting we could stop ISIS from achieving their goal of exterminating 99% of the world’s population by blocking their Face Book account? Seriously though Mike, do you think there is a way to protect against this type of threat without these weapons, I can only see “cyber” playing a small but important role in this. This A-level qualified Gunner understood the difference quite well thank you, and the adjustments made for windage, barrel wear, etc. I since went on to earn my degree whilst a Sergeant still understanding simple ballistics. One trick that the gunners learnt and demonstrated on firepower demos was to fire one round high-angle then drop the barrel and fire a round low angle. If they were fast and accurate enough they could achieve two rounds on target. This suggests that all gunners are rather well aware of the concept of high and low angle shots. Mike McClory, David Hogan: gentlemen, your comments fully accepted. [Allow me a small ‘poke’ at pomposity and delusions of grandeur amongst those notionally at the various summits of our society, just as I will allow you to joke about Facebook!] And surprisingly I do believe we are all on the same side of the equation. [That is if I can still remember how to transpose terms of such from side to side?] I had a dear friend (he ended up as a half-colonel in the Royal Artillery) and we both did our A levels in 1959. Patrick was from an Army family (his father was some very senior figure in the Army Judge Advocate? Squad) and there was no career other than in the Services to which he was ever going. Sandhurst, etc. I do recall him telling me the ‘two shells landing at the same time’ trick : and was delighted to be able to tell him how and why such was possible. His mathematics was not good! Though if I am ever in a fight, I certainly want him on my side. I used to enjoy teasing Patrick (it was the time of the Soviet invasion of Afghanistan) by suggesting that the way to deal with those who do not ‘play’ by our military rules (ie hide behind rocks, sneak in at night, go after the local hearts and minds first?…) was to follow the example of the most successful medieval Mediterranean city Venice. Who simply paid the then modern equivalent of Dane-geld to the pirates who were disturbing trade. De Bono suggested the same to the US during VietNam : bribe the VC. Its cheaper! I hope my point is clear. We have (at least those at the summit of the military in Western societies) believed for centuries that the only way for conflict is faster, heavier, longer, ….Whatever number ‘they’ have, we must have more? It has cost millions of ordinary persons lives to demonstrate the fallacy of those arguments. More of the same, whilst easiest, is not the answer. I am happy to expand directly if you contact me. My e-mail is elsewhere in this blog.